EXETER – The Monarchs have had a resurgence back to the section championship over the last two seasons with back-to-back appearances in the D-II title game. Last year, they win the championship defeating the Bakersfield Christian Eagles in a 3-2 thriller. The division title ended a 10-year drought for Exeter and is the highest division won for any sport in school history. Exeter head coach Samantha Hilvers hopes the success over the last two seasons have laid the ground work for the makings of another dominate program in Exeter. The Monarchs return a core of nine players all with experience of winning a valley title. Corinne Acosta headlines the group. The outside hitter led the team with 343 kills last season. Last year’s CSL most valuable player has a new appearance about her on the court. Acosta improved her striking over the off season as she developed a change-up style hit. Already known as a power hitter, many in the CSL will be caught off guard by her off-speed spike. Hilvers says Acosta has also stepped into a leadership role for this fall. “It is fun to watch her play and interact with her teammates,” Hilvers said. Teagan Bryant is another returning outside hitter and will play opposite Acosta this season. 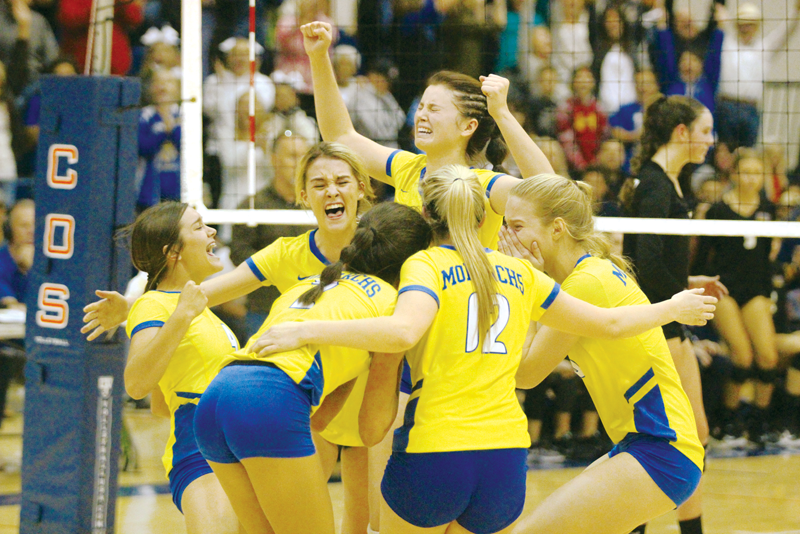 Bryant scored the game winning point at last year’s valley championship match. She is expected provide a good contrast to Acosta’s power along the net. Exeter returns their libero in Katelyn Kirkman as well. Club competition offered her many chances to improve as a defensive specialist and on her serve receive. Hilvers says Kirkman has improved greatly at both, and has a more commanding presence on the court. “She has come into her own element this year,” Hilvers said. The number of returners that the Monarchs have should lessen the growing pains out on the court, but there are still two crucial position groups which need filling. The biggest task for the Monarchs is to find a set of hands to replace Kassi Stolz at setter. At the end of last season, Hilvers was at a loss as to who would be this year’s setter. In the time since then, she has had three returners offer their services at the position. Meghan Tilschner was followed by Mattie Fry, and then Haley Henderson was the third. It is interesting to note that all three were listed as outside hitters last season, and with those positions filled, might be looking for where they could get the most playing time. A fourth possible setter came by the way of a transfer. Grace Germaine, a junior, grew up in Exeter but had lived for the last few years in Colorado. She returns after playing her sophomore year for Ponderosa High School. She was the number two setter for the Mustangs and ran a 6-2 offense. “I love having kids who are going to have someone behind them pushing them and making them better,” Hilvers said. In Exeter’s first match at Woodlake on Monday, Aug. 13, the Monarchs could see different lineups with different setters as Hilvers analyzes her options. The middle hitter position is the second question mark for the Monarchs. The graduation of Lex Kirkman and Madelyn Sweepe took 481 kills. The lone experienced returner is Julie Nelson. Last year, Nelson had 63 kills. Joining her will be two newcomers to the varsity level in Sarah Genter and Sierrah Bakker. This season, Exeter has loaded their non-league schedule with top competition once again. Games against Clovis West, Central, and Clovis East return. The Monarchs lost all three matches. One change to this year, however, is that matches are more spread out. Clovis West is scheduled for game number two of the season on Tuesday, Aug. 14. Central is scheduled for Thursday, Aug. 30 at 6:30 p.m. Clovis East will be played on Tuesday, Sept. 4, filling a CSL bye slot for Exeter. “It has been like putting together a jigsaw puzzle to see when we could play and where,” said Hilvers. In 2017, the California Interscholastic Federation has moved league play up two weeks. That, paired with the addition of the Hanford West Huskies, gives the CSL an odd number of teams, making bye games necessary on the league schedule.